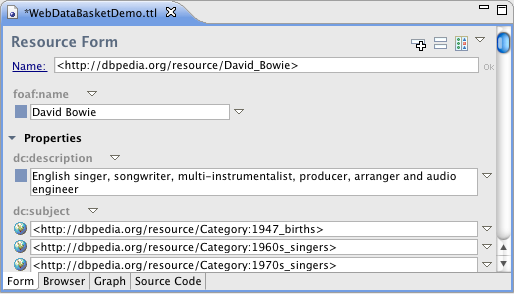 One of the little new features in TopBraid Composer 3.5 is the Web Data Basket view. 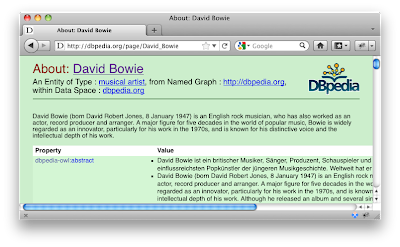 This can be used to incrementally download Linked Data (either RDFa or RDF) while browsing the web. The best way to experience this is by getting a small TBC Firefox extension. This will add a tiny TopBraid button to the lower right corner of your browser. In order to facilitate the use of this data, TopBraid Composer will automatically add missing imports to namespaces such as foaf and skos. When you follow a hyperlink in your web browser, the basket will get more content. This means that the system will accumulate any Linked Data into TopBraid as you navigate through the web. 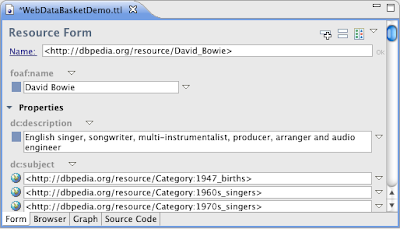 This little Web Data Basket makes it easy to collect Linked Data without having to leave your favorite tools. I think it provides a fine example of how Linked Data could be used, e.g. to build up a shopping list of products backed with GoodRelations data.